Today marks the eighth anniversary of the violent outburst against Serbs in Kosovo-Metohija (KiM) which left 19 people dead while over 4.000 Serbs and other non-Albanians were forced to leave their homes. 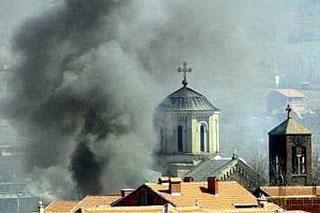 Around 900 houses and 35 churches and monasteries of the Serbian Orthodox Church were set on fire, including mediaeval holy sites such as the Church of Our Lady of Ljevis in Prizren which dates back to the 14th century. In the wave of violence on March 17 and 18 in 2004, around 19 individuals were murdered, eight of them Serbs and 11 Albanians who were killed by KFOR members in self-defence. A total of 954 individuals were wounded, including dozens of members of international troops, and 72 UN vehicles were destroyed. Six cities and nine villages were ethnically cleansed, while the Devic Monastery near Srbica was burnt down and its reconstruction has not been completed yet. A number of cemeteries in KiM were desecrated and a great number of valuable icons and other church relics were either damaged or disappeared, together with registries of baptisms, marriages and deaths which testify of the centuries-long Serb presence in the province. Representatives of the UNESCO mission later visited the demolished Orthodox churches and monasteries in KiM and drafted an assessment according to which the value of the damages inflicted on the religious facilities totals approximately USD 30 million. The dormitories of the Saint Archangels Monastery near Prizren were set on fire, and the St. George's Church near the Church of Our Virgin of Ljevis in Prizren from 16th century was also set on fire. The reconstruction of the Our Lady of Ljevis monastery is still underway, and the Church of St. George was consecrated after reconstruction in the winter of 2010. Prizren is now home to only some 20 Serbs. The building of the Theological Seminary in Prizren was also set on fire and the seat of the Diocese of Raska and Prizren was desecrated. The pogrom was triggered by the campaign conducted by Albanian media according to which Kosovo Serbs and their dogs chased six Albanian boys from the village of Cabar near Zubin Potok across the Ibar River, and three of them died in the incident. The investigation of the UNMIK police established that the Albanian charges were false and spokesman of the international police Neridz Sing stated that fter the incident, the surviving boys were fiercely pressured by Albanian reporters and politicians into pressing accusations against Serbs from the nearby village. Albanian extremists first staged protests in southern Kosovska Mitrovica, and at dusk they launched an armed attack on Serbs in the northern part of the city, where KFOR soldiers had to intervene. Violence and attacks spread to the south, to the village of Caglavica and other dwellings in the Pristina area, and Serb villages and cities all around the province, such as Lipljan, Gnjilane, Urosevac, Djakovica and Prizren, were targeted by the violent outburst. The clashes continued the next day, on March 18, when Serbs were forced to abandon Kosovo Polje, Obilic, Plemetina near Vucitrn, Svinjare near Kosovska Mitrovica, while all 28 houses of Serb returnees and the village hall were set on fire in Bijelo Polje near Pec. Small groups of Serbs sought shelter in KFOR bases, while others took refuge in safer Serb enclaves. Most of them still live in collective centres, container settlements near Gracanica or in the homes of other people. A very small number of them decided to return and around 250 Serbs fled to central Serbia. After the pogrom of Serbs, the authorities arrested 270 Albanians, and 143 individuals were sentenced, most of them to financial fines while 67 individuals were sent to prison. The interim Kosovo parliament in Pristina unilaterally declared independence from the Republic of Serbia on February 17, 2008. Kosovo is now recognised by 86 out of 193 UN members, as well as 22 out of 27 EU members.